NOTE: NOT AVAILABLE FOR SHIPMENT TO AUSTRALIA OR NEW ZEALAND. 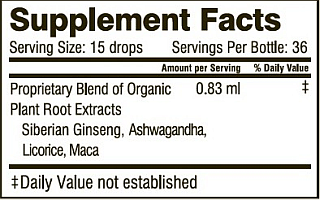 Other Ingredients: Purified water and alcohol (25%) from tinctures. Side effects - The ingredients in Herbal Adrenal Support Formula have no known detrimental side effects when used as directed. Quality and purity - Herbal Adrenal Support Formula is a completely natural dietary supplement It contains NO sugar, yeast, corn, wheat, soy, dyes, coloring agents, egg, dairy, or animal products.